WALTHAM, Mass. 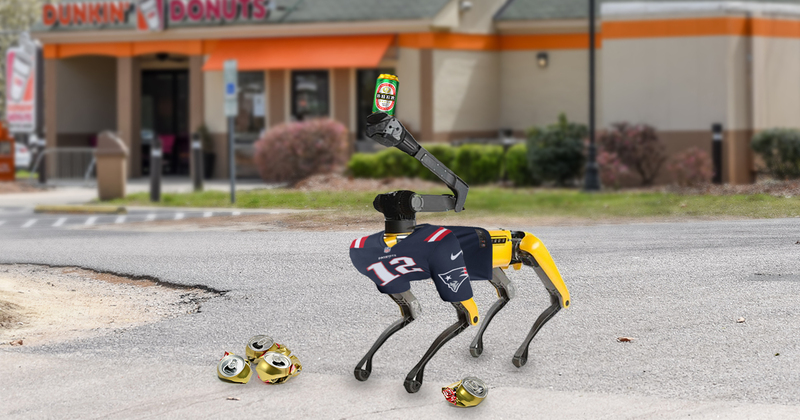 — After celebrating a 13-3 victory by the New England Patriots at last night’s Super Bowl, scientists at Boston Dynamics coming into work the next morning discovered their SpotMini model robot drunk in the parking lot of a local Dunkin’ Donuts. The SpotMini model, initially designed for complex search and rescue tasks, was found sporting a beer-stained Tom Brady jersey and loudly chanting “DO YOUR JOB,” to itself in a thick, digitized Boston accent. Security footage from last night showed the android escaping the facility, performing parkour in the streets, chugging beers with fellow Bostonians, and lighting off firecrackers that it purchased on the New Hampshire state line in celebration of the team’s victory. However, the sheer quantity of alcohol caused SpotMini to short-circuit and drunkenly stumble to the Dunkin’ Donuts parking lot. At press time, SpotMini loudly praised Bill Belichick and Robert Kraft for supporting President Trump and “not signing that traitah Colin Kaepernick” before shutting down due to a robotic hangover.